EDWARD B. SANNER. The student of history finds abundant food for thought in the life record of this gentleman who has materially added to the wealth and importance of Shelby County as one of the leading agricultural centers of the great Prairie State since he identified himself with its most stirring and enterprising farmers and stock-raisers a quarter of a century ago. He has extensive landed interests both in this and Macon County, and a beautiful home in Penn Township, where he has a model farm. He devotes this estate largely to stock-raising purposes, having here one of the best herds of Herefords in this section, and several fine Cleveland Bay horses among other valuable stock. A view of this fine homestead appears on another page of this volume. Our subject was born April 29, 1839, in one of the pioneer homes of Madison County. 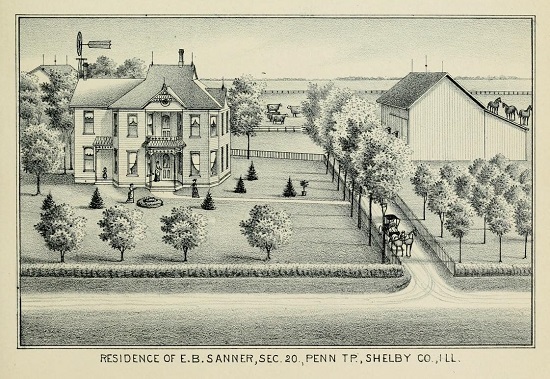 His father, Samuel Sanner, was an early settler of that section of Illinois, who took an active part in its development during the thirty-three years that he resided there. He was a Pennsylvanian by birth, born in Northumberland. He married Barbara Paul, a native of that part of Virginia now included in West Virginia, and in 1833 came with her from Pennsylvania to this State. In 1866 he removed with his family to this county, and here his life was closed in his home in Penn Township in April, 1880, death coming to him after a long and busy career. He left a record worthy of emulation and an untarnished name that is revered by his descendants and by all who knew him. 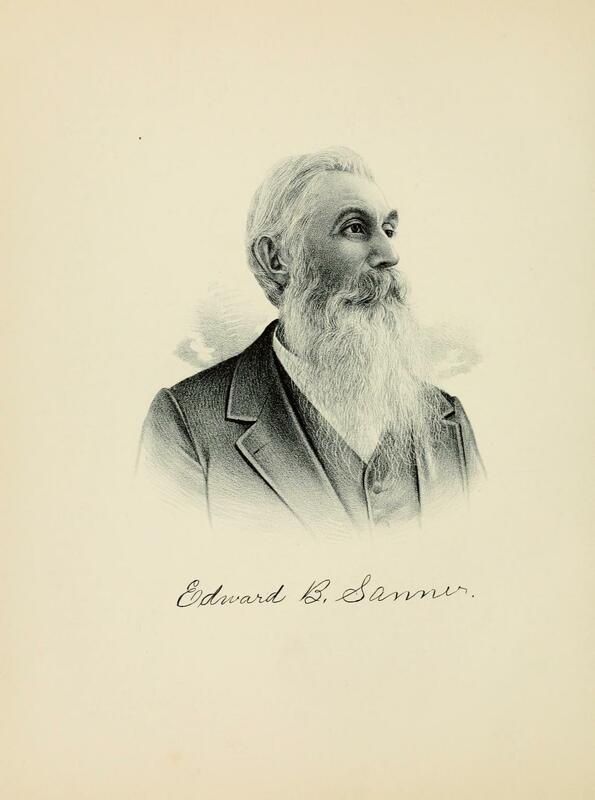 Edward Sanner grew to manhood under good home influences, and principles of industry and of doing well whatever he undertook were early instilled into his mind and undoubtedly have contributed much to his prosperity since he began his independent career as a farmer. As soon as he was old enough he attended the district school and continued a student there until he became of age, and as he made the best of his opportunities he obtained a sound, practical education. His father intended to send him to college at Lebanon, but his services were needed at home, and the idea of a course at college had to he abandoned. He was living quietly in his father's home in Madison County when the great Civil War between the North and South broke out, and fired with patriotism, he desired to serve his country. But here again his wishes had to give way to his sense of duty, as some of his brothers had entered the army, and he was more than ever needed to help carry on the farm, so he gave up the thought of enlisting in a regiment of zouaves as he had contemplated. But the work that he performed at home in sewing the seed and harvesting the crops was as necessary to carrying on the war to a successful issue as the hard fighting that the soldiers did at the front, for the wheat and corn raised on the broad prairies of the Middle and Western States to supply the armies with needed food were important factors in suppressing the rebellion and preserving the Union. The removal of the Sanner family, father and sons with their families, to this county in 1866, was an important event in the life of our subject. In the fall of that year he located on land bought from the Illinois Central Railway Company, comprising the west half of section 20, Township 14, (Penn Township), range 3, east. Penn Township then formed a part of Pickaway, and the prairies of the northern part had been passed by, with but few exceptions, as unfit for settlement on account of the swampy character of the soil. This proved to be a mistaken idea, as since some of the finest farms of the county have been improved here, our subject's among others. With characteristic energy he entered upon the hard task before him of redeeming his land from its wild condition by draining it and placing it under careful cultivation, and to-day there is not a more desirable farm throughout the length and breadth of Shelby County than his, with its well-tilled fields yielding abundant harvests, and its commodious, conveniently arranged frame buildings, including a large and handsome residence of a modern style of architecture, with pleasant surroundings. He has added to his original purchase, and now has one thousand and ninety acres of well-improved prairie land, two hundred and ninety acres of it lying in Macon County, and the remainder in this county. Carrying on an extensive business as a general farmer, Mr. Sanner gives much attention to stockraising, Herefords, of which he has a valuable herd, being his favorite breed of cattle, and in horses, Cleveland Bays stand first with him, and he has some fine specimens of that blood. The ceremony which made Miss Naomi Pierson, of Bunker Hill, the wife of our subject was performed November 15, 1865, anil in her he has found one of life's choicest blessings. Their wedded life has been productive to them of nine children, named Willie, Albert, Hattie, Clifford, Ruth, Fanny, Samuel, Quintus and Naomi. Fanny died at the age of twelve weeks. Mrs. Sanner is a native of Jacksonville, Morgan County, Ill., born in 1840, and is a daughter of Dr. Daniel C. and Naomi C. (Nixon) Pierson, natives of New Jersey. 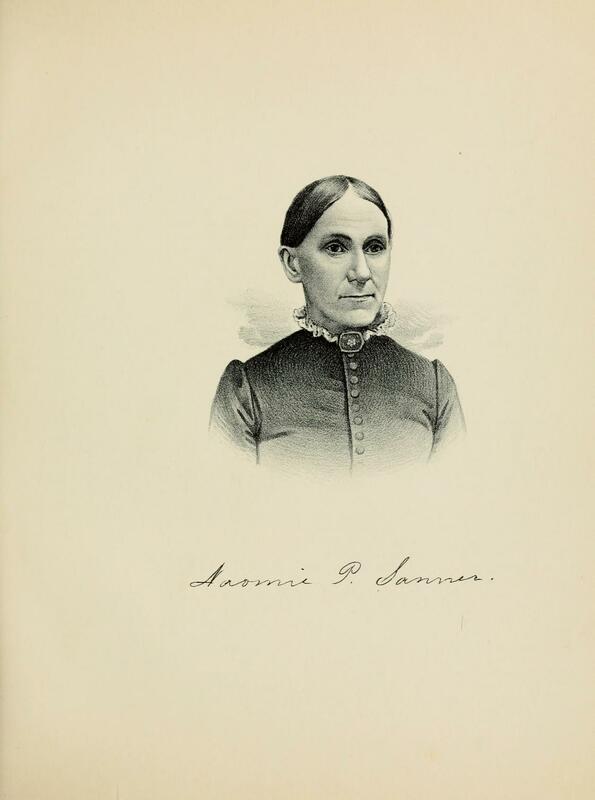 Her father practiced medicine in his native State several years prior to his removal to Illinois in 1833, when he became a pioneer physician of Jacksonville. Nature has dealt generously with our subject and has not only endowed him with a fine physique, but has given him a keen, discerning, well-poised mind, and with these as capital, seconded by decision of character and tenacity of purpose, he could not fail to make life worth living and to achieve whatever he desired to accomplish. He is of an open-minded, fair, generous disposition, and has gathered around himself many warm friends, whom he is ever ready to oblige, and in times of trouble or need they are sure of his sympathy and assistance. Nurtured in the faith of the Republican party, which was organized in his boyhood, and taught to believe that its tenets were the only true ones for the conduct of the Government, Mr. Sanner has always been a devoted follower of the party ever since he began to exercise the right of suffrage by casting his first Presidential vote for Abraham Lincoln in 1860. The attention of the reader is invited to the lithographic portraits of Mr. and Mrs. Sanner, presented in this connection. Extracted 08 Apr 2017 by Norma Hass from 1891 Portrait and Biographical Record of Shelby and Moultrie Counties Illinois, pages 244-248, and 375.